The rubber industry in India dates back to 1921 when the first rubber goods manufacturing plant was established in Kolkata and since then the rubber industry has been growing and expanding. After 1947, that is, the year of India’s independence, the quantity and range of rubber products increased and slowly the industry saw technological evolution as well. Export front of the industry has seen tremendous growth in the last few years along with covering all kinds of domestic demands. The factors responsible for the exponential growth in 21st century are vast internal market, rapid industrialisation, on-going economic reforms, and improved living standards of the masses. 5th largest consumer of natural rubber and synthetic rubber together in the world. India is also the world’s largest manufacturer of reclaim rubber. Kerala, Punjab and Maharashtra have highest production of rubber making India 1st in productivity all over the world. The per capita consumption of rubber in India is only 990 gms against 9 to 16 kilos in Japan, USA and Europe. Therefore there are enormous development prospects of the business in the future. A wide range of rubber products are manufactured by the Indian rubber industry that serve industries like the three wings of defence, civil, aviation, aeronautics, railways, agriculture, transport as also textiles, engineering industries, pharmaceuticals, mines, steel plants, ports, family planning programmes, hospitals, sports, i.e. practically to every field under the sun. The industry saw a price crash in 2014-15 but the performance in 2015-16 has been better. ICRA predicted 9-10% growth in domestic tyre volumes during 2015-16. 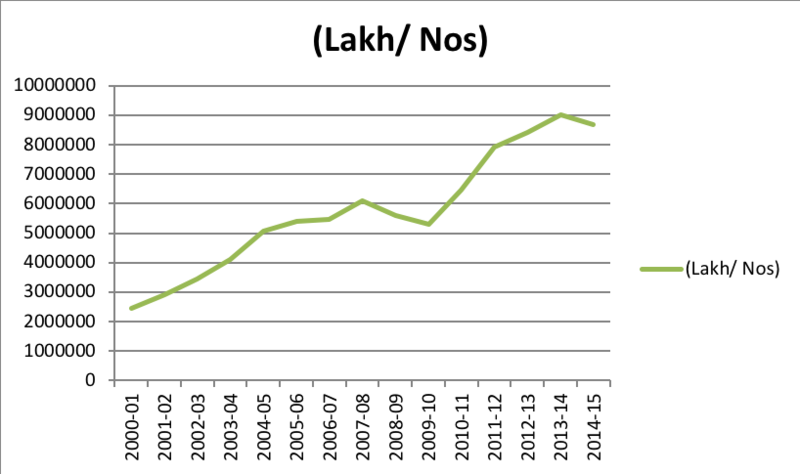 In 2014-15, production of natural rubber dropped to 17.33% while its imports saw an increase upto 24.89%. The quantity of rubber consumed during the first nine months of the current fiscal was up 4.32%. According to Rubber Board estimate, the production of natural rubber for 2015-16 is projected at 7.50 lakh tonnes with a growth rate of 16.28% and the consumption is projected at 10.56 lakh tonnes with a growth of 3.44%. The tyre sector produces all types of auto tyres, conventional & radial tyres and exports to foreign nations. The non-tyre sector comprises of different sized units that produce hi-tech industrial items. The yardstick to measure the growth rate of the industry is rubber consumption – natural, synthetic and reclaims rubber. The Indian Tyre Industry originated in 1926 when Dunlop Rubber Limited set up the first tyre company in West Bengal followed by MRF in 1946. Tyre Industry is predominantly ruled by organized sector while the unorganized sector consists of bicycle tyres. Indian tyres are made such that they are compatible for kutcha village roads as well as new pakka roads. Also they are meant and expected to perform in hot, cold as well as wet climatic conditions. 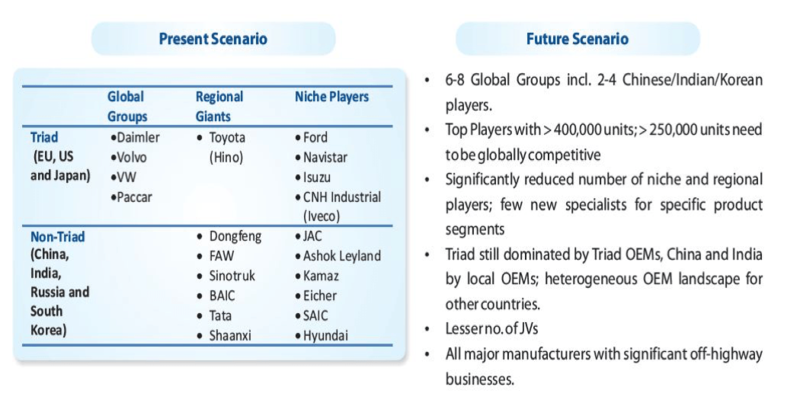 Indian tyre industry is an essential part of the auto segment and its fortunes are reliant on those of the auto segment. With the progressing lull of the auto segment, the tyre industry saw only moderate development in the current financial year. Unorganized Sector is small and consists mainly of bicycle tyres while organized sector covers all other major tyre types. The organized sector players supply the tread material to the unorganized sector players, who in turn re-tread the tyres. On the map below the production plants of major companies of Tyre are marked. 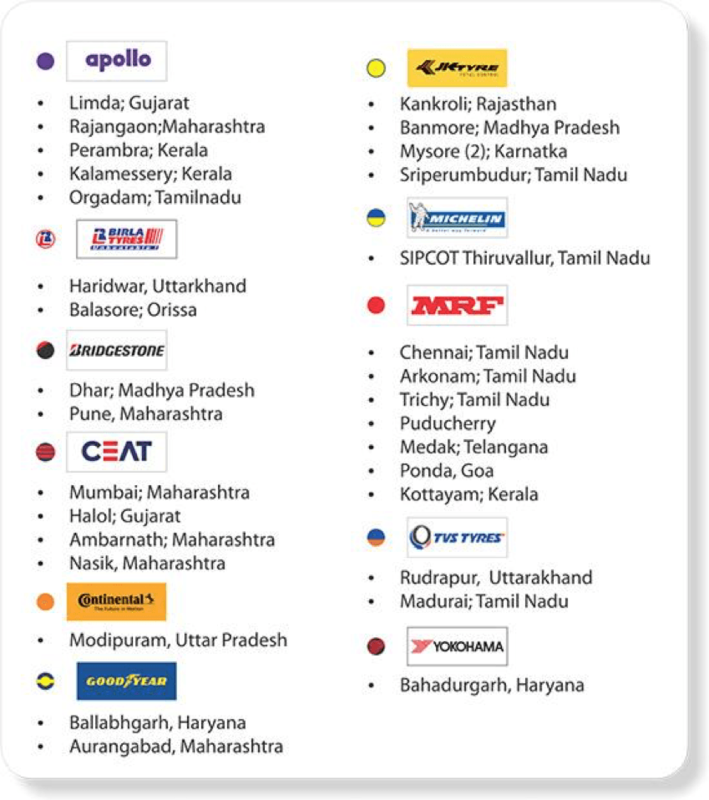 This is the representation of all the 11 major companies which are member of Automotive Tyre Manufacturers’ Association (ATMA). There’s a direct correlation between the size of a country’s gross domestic product, or GDP, and its automotive industry and automotive industry directly impacts the tyre and rubber industry. GDP accounts for the consumption, investments, net exports, and government spending during a given time period. The Indian auto industry is one of the largest in the world with an annual production of 23.37 million vehicles in FY 2014-15, following a growth of 8.68 per cent over the last year. The automobile industry accounts for 7.1 per cent of the country’s gross domestic product (GDP). The Two Wheelers segment with 81 per cent market share is the leader of the Indian Automobile market owing to a growing middle class and a young population. Moreover, the growing interest of the companies in exploring the rural markets further aided the growth of the sector. The overall Passenger Vehicle (PV) segment has 13 per cent market share. 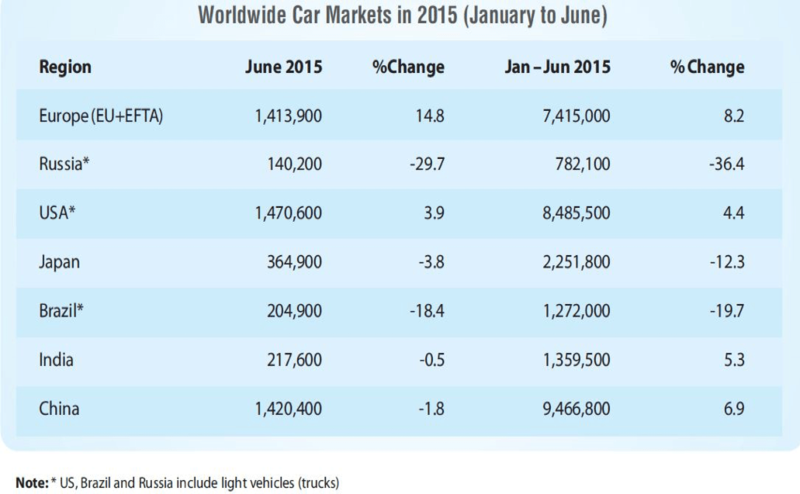 India is also a prominent auto exporter and has strong export growth expectations for the near future. In FY 2014-15, automobile exports grew by 15 per cent over the last year. In addition, several initiatives by the Government of India and the major automobile players in the Indian market are expected to make India a leader in the Two Wheeler (2W) and Four Wheeler (4W) market in the world by 2020. The kind of investment by government in the tyre sector in 2015-16 is unprecedented in India. Capacity creation for tyre industry will in turn increase capacity of rubber and tyre sector as well. Under Free Trade Agreements Government has reduced customs duty in tyres with no corresponding reduction in basic rate of customs duty on Natural Rubber. Government to allow import of limited quantity of NR (say 200,000 MT) under a Tariff Rate Quota (TRQ) basis for FY 2014-15 at a concessional rate of duty of 7.5% or Rs. 10 per kg, whichever is lower. 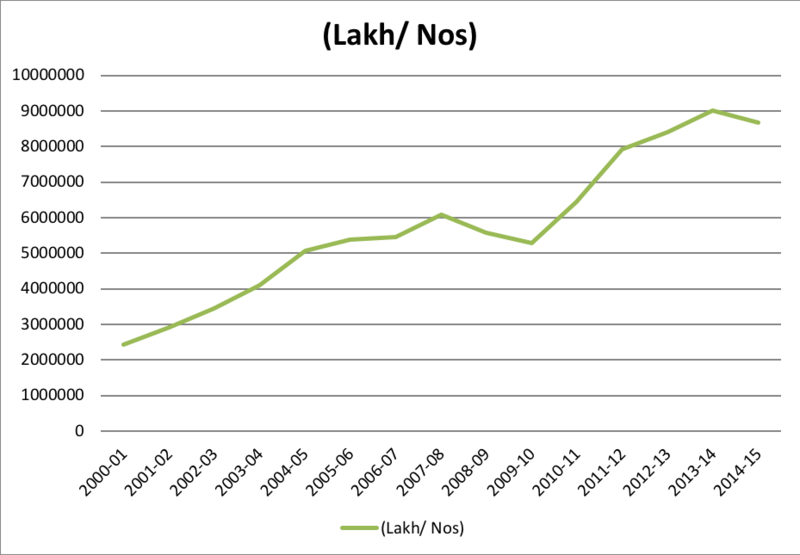 In Dec.`10, Finance Ministry has allowed 40,000 MT of NR at 7.5% concessional duty on TRQ basis, a provision that was expected to continue on an annual rolling basis but was discontinued without any valid reasons/justification. Reduction in customs duty on EPDM rubber would reduce the input costs for the auto industry, tyres, rubber profile manufacturers. Government of India can increase the customs duty on tyres from existing rate of 10% (to a higher rate of duty) without any corresponding action/explanation to the WTO. Under Para 4.1.4 of Foreign Trade Policy, Government has granted exemption from payment of all kind of duties on Carbon Black under Advance License Authorization imports. Rate of Interest for delayed payment of excise duty/ service tax should be restored back to 13% p.a. from existing 18%. All categories of tyres can be exported freely. All categories of new tyres can be imported freely. No WTO Bound Rates for tyres and tubes. Imports of Second hand/Retreaded tyres (major categories) are restricted under EXIM Policy and can be done against an import licence. Tyres imports under Regional Trade Agreements (Asia Pacific Trade Agreement, Indo-Sri Lanka, SAFTA, India-Singapore, ASEAN, India-Malaysia etc) allowed at preferential rates of import duty. All tyre industry related raw-materials can be imported freely (under OGL). Tyre Industry de-licensed in September, 1989. Natural Rubber (NR) principal raw material of Tyre Industry, is in the ‘Negative List` (i.e. not eligible for any concession in Custom duty) under various Trade Agreements, i.e. India ASEAN Free Trade Agreement, India Sri Lanka Free Trade Agreement, South Asian Free Trade Agreement (SAFTA), India Malaysia Comprehensive Economic Cooperation Agreement (CECA), India-Singapore Comprehensive Economic Cooperation Agreement and India-South Korea Comprehensive Economic Partnership Agreement (CEPA). The Government of India has announced highway projects worth US$ 93billion, which include government flagship National Highways Development Project (NHDP) with total investment of US$ 45billion over next three years. The Union government has approved a plan for construction of around 1,000 km of expressways at an estimated cost of Rs 16.68 crore on a design-build-finance-operate-transfer (DBFOT) mode. The corridors approved for the development of expressways include DelhiChandigarh (249 km), Bengaluru-Chennai (334 km), Delhi-Jaipur (261 km), Vadodara-Mumbai (400 km). Bus & Truck tyre production declined slightly in March 2015 through the production went up by 4% in the fiscal. Passenger Car tyre production grew by 13% during the fiscal though the production saw the growth moderating in March 2015. 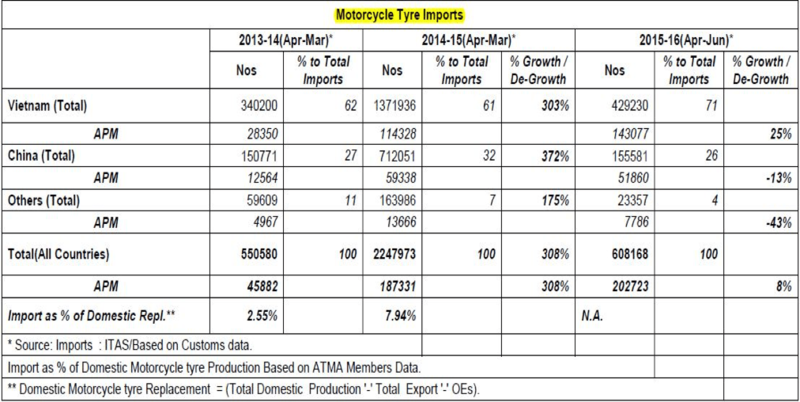 Motorcycle tyre production showed a declining trend in the last quarter though March production saw an upswing. Overall tyre production went up by 13% in the FY15. The double digit growth came after three years of moderate growth. Bus & Truck tyre were particularly on the receiving end of the slowdown in the export markets and fierce competition from China, it went down by 9%. Exports of passenger car tyres however saw a healthy growth of 20% during the fiscal. 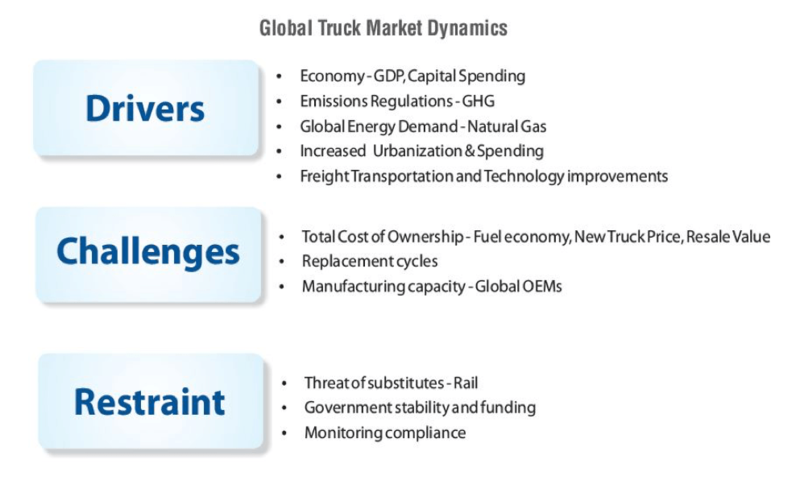 Radialization heavy commercial vehicle segment has reached an estimated 33% in FY15. Total tyre exports contracted by 4% in FY15. Occurrence of large scale import of cheap automobile tyres, especially from China. The reasons for increase of such import is reported due to significant increase in capacity creation and slowdown of domestic market in China and imposition of anti-dumping/safeguard duty by some countries like USA, Brazil, South Africa etc. DGAD has recently received two petitions from domestic industry for imposing anti-dumping and countervailing duty on imports of Bus and Truck Radial Tyres from China PR. China, Vietnam and South Korea are the major country from where the tyres are imported. While domestic natural consumption has increased by 3.5% YOY in FY 14-15 (Apr-Oct), on other hand domestic Natural Rubber production has declined by (-)9.5% in the corresponding period. Though still trailing last year’s numbers, NR Production in July increased sequentially and the gap with production figure of July ’14 narrowed to 4%. In the first four months of current fiscal, the production is down by 14%. NR Consumption too went up sequentially in July but stood marginally lower than July ’14 figures. In the year-to-date period, the consumption was almost static. NR Imports in July declined by 15% over a year ago period. NR Exports continue to dwindle. First four months of current fiscal saw export of just 42 MT. NR Production in ANRPC countries went up by a subdued 3% in July after two successive months of 6% growth. Total NR production till July however stood 2% lower than previous calendar in view of steep fall of more than 11% witnessed in February. NR Consumption by ANRPC countries went up by 6% in July, highest during the current calendar year. Total NR consumption growth till July stood at 3%. India’s NR consumption during first seven months of current calendar stood marginally lower than corresponding period in the previous year. China’s NR consumption was however up by 5% even on a higher base. The market of tyres is dependent on the two important aspects, on is the rubber industry and on the automobile industry. Production expected to continue to grow at a higher pace in India, South East Asia, Eurasia and South America. European and North American designed products expected to be introduced in developing markets. India can profit from fall in commodity prices. Oil is the largest import of India and India has already profited due to price fall. India cannot avoid all imports from China. Indian imports account for 21% only from China. Due to slowdown Chinese players will increase their exports which can negatively affect other economies. China is the second-largest economy in the world, therefore the slowdown will impact global economy as a whole. Australian Company has discovered a way to recycle tyres in an environment friendly manner. Morphing tyres are being developed that change shape to adapt to different road and climatic conditions. Tyre is perhaps the only finished product (vis-a-vis its basic raw material) on which ‘duty inversion’ not only continues but has actually aggravated in recent years.